The average corn planting date is considerably earlier now compared to 25 years ago, especially in the Midwest USA. In NY, planting is earlier than ever but still lags behind most upper Midwest states. Certainly, the soils in the upper Midwest States are as cold as New York in late April or early May. Consequently, the slower planting pace in New York must be attributed to either wetter soils; lack of readiness, especially for dairy producers; previous negative experiences by growers with April planting dates; or lack of belief that the newer hybrids with seed treatments can be planted into somewhat cold April soils. Most growers plant their corn at the “one size fits all” depth of 2-inches. Early-planted corn (~mid-April), however, can take 3 to 4 weeks to get out of the ground and a shallower planting depth may be beneficial for April planting dates. When planting is delayed until late May, as in 2011 and 2014, growers in NY wonder if they should switch to an earlier maturing hybrid. We conducted small-plot research at the Aurora Research Farm in 2013 and 2014 to answer three questions concerning corn planting: 1) Can corn be safely planted in early to late April on well-drained soils in NY without risk of poor stands and subsequent yield loss, 2) when should grain growers switch from a full-season to a shorter season hybrid, if planting is delayed, and 3) is the 2-inch seeding depth optimum from early April through late May planting dates? We planted 103-day (203-44STXRIB from Channel) relative maturity (RM) and a 96-day (DKC46-20VT3P RIB from DeKalb) RM hybrids on ~April 10, ~April 20, ~May 6, ~May 19, and ~May 30 at 1.0, 1.5, 2.0, 2.5, and 3.0 inch seeding depths at a rate of 31,800 seeds/acre in 2013 and 2014. We determined stand establishment at ~ the 4th leaf stage (V4), about 3-6 weeks after planting, depending upon planting date. We harvested all plots on October 27th in 2013 and on November 5th in 2014. 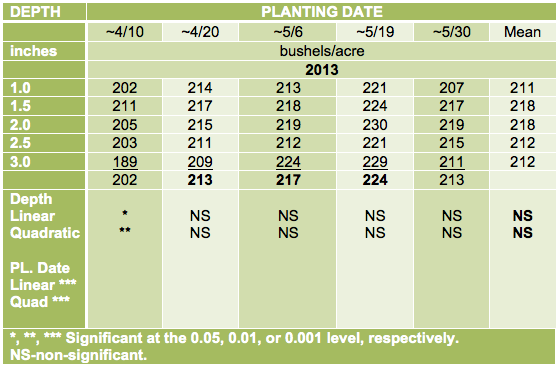 Plant populations had a significant year x planting date x seeding depth interaction (Table 1). 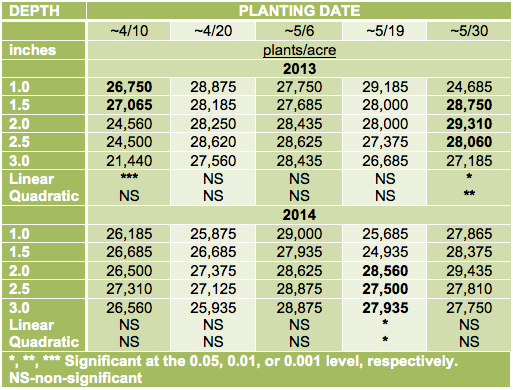 On most planting dates in both years, seeding depth did not affect plant populations (Table 1). In 2013, however, plant populations at the early April planting date had a negative linear response to seeding depths (~27,000 plants/acre at the 1.0 and 1.5 inch planting depths, ~24,500 plants/acre at the 2.0 and 2.5 inch planting depths, and only 21,500 plants/acre at the 3.0 inch depth). Presumably, the deeper-planted corn struggled to emerge because of cool conditions, accompanied by some soil crusting. Plant populations at the late May planting date in 2013, however, had a quadratic response (fewer than 25,000 plants/acre at the 1.0 inch planting depth, ~28,000-29,000 plants/acre from the 1.5 to 2.5 inch depths, before decreasing to ~27,000 plants/acre at the 3.0 inch depth). Presumably, soil conditions dried out in the top 1-inch depth resulting in poor emergence. Likewise, in 2014, there was an extended dry period shortly before and after planting on May 19th resulting in fewer than 26,000 plants/acre at the 1.0 and 1.5 inch seeding depths. Nevertheless, the 1.5 and 2.0 inch planting depths resulted in the most consistent stand establishment across all planting dates in both years of this study. Table 1. Plant populations of corn at the 4th leaf stage (V4) at five planting dates and five seeding depths, when averaged across two hybrids, in 2013 and in 2014. Although grain yield had no planting date x seeding depth interaction (P=0.06), the early April planting date did show a quadratic response to seeding depth with the 1.5 inch depth yielding 211 bushels/acre compared to only 189 bushels/acre for the 3.0 inch seeding depth (Table 2). On all the other planting dates, however, grain yield did not respond to seeding depth. Apparently, corn with its hygroscopic kernel can emerge adequately from a shallow depth in dry soil conditions, and with its coleoptile (seed leaf, first to emerge through the soil) can emerge adequately through crusted soils. Table 2. Yield of corn at five planting dates and five seeding depths, when averaged across two years (2014 and 2014) and two hybrids (DKC46-20 VT3P-RIB and 203-44STXRIB). Grain yield showed a quadratic response to planting dates with the regression equation indicating that maximum yield occurred sometime between May 15 and May 20 (Table 2). This was somewhat later than expected. We expected that maximum yields would occur sometime between April 20 and May 20, especially because plant populations showed a quadratic response to planting dates with the numerically highest populations at the May 6 planting date (~28,525 plants/acre compared with 27,450 plants/acre for April 20 and 27,385 plants/acre for the May 19 planting date, averaged across years, hybrids, and planting depths). Consequently, it is not clear why maximum yield occurred from ~ May 15-20 rather than the ~May 5- 20 planting date range. The 103 day hybrid yielded ~5% higher (220 bushels/acre) than the 96-day hybrid (209 bushels/acre), when averaged across years, planting dates, and seeding depths. Surprisingly, there was no hybrid x planting date interaction, which indicates that the longer-season hybrid will yield more than the shorter-season hybrid when planted from early April through late May in the Finger Lakes Region of NY. On the May 19th planting date, however, grain yield averaged only 3% greater (228 bushels/acre for the 103-day compared to 221 bushels/acre for 96-day hybrid) with significantly higher grain moisture (23.5 vs.19.3%, respectively). On the May 30th planting date, grain yield averaged ~4% greater (218 bushels/acre for the 103-day compared with 210 bushels/acre for the 96 day hybrid) but with much higher grain moisture (29.8% vs. 23.5% moisture, respectively). Given the much greater drying costs or much greater delay in harvest for the 103 day hybrid to dry down when planted in late May, NY growers should probably consider switching from a full-season to a medium-season hybrid shortly after May 20. The reluctance of many corn growers in NY to plant corn in April may serve them well as indicated by maximum yields occurring sometime between May 15 and May 20 in this study. Growers, however, cannot plant their corn crop between May 15 and May 20 each year so the question remains “how early should growers begin to plant corn NY”? Although yields were 5% lower at the April 20 planting date (213 bushels/acre) vs. the May 19 planting date (224 bushels/acre), plant populations were similar and grain moistures were lower (17.5% vs. 21.4%, respectively). Consequently, relative profit would be essentially the same (assuming $4.00/bushel corn and $0.04/point of moisture drying costs) between these two planting dates. If growers are reluctant to start as early as late April, certainly the first week of May is an excellent time given the higher plant populations (28,525 plants/acre) compared with the May 19 planting date (27,385 plants/acre), lower grain moisture (18.7% vs. 21.4%, respectively), albeit 3% lower yields (217 bushels/acre vs. 224 bushels/acre). Nevertheless, relative profit would be similar for the two planting dates, given the assumptions of $4.00 corn and $0.04/bushel/point drying costs. Regardless, if growers begin planting in late April or early May, corn growers in NY should probably plant full-season hybrids until around May 20 because of the yield advantage (6.3% on April 20, 5.4% on May 6, and 3.0% on May 20). Grain moisture differences, however, widen at each successive planting date (17.9 vs. 17.1% for April 20, 19.8% vs. 17.7% for May 6, and 23.5% vs. 19.3% grain moisture for May 19, respectively) so beyond May 20 the higher grain drying costs would offset the yield advantage or require a delay in harvest, which could lead to more in-field losses of the full-season hybrid before harvest. Consequently, a switch to shorter-season hybrids after May 20 is probably the most economical and risk-averse management strategy. Planting at the 1.5 inch to 2.0 inch depths consistently resulted in the highest plant populations and grain yields among seeding depths across all planting dates. The 2.0 inch planting depth had less than 80% emergence (~25,000 plants/acre) only on the April 10 planting date in 2013 and the 1.5 inch planting depth had less than 80% emergence only on the May 19 planting date in 2014. Planting depth did not affect yield, however, (except for the April 10 planting date) but the 1.5 to 2.0 inch depth looks optimum across most planting dates in this study. Keep in mind that this study was conducted on a well-drained silt loam soil in the Finger Lakes Region and does not apply to poorly drained clay soils or regions of the state where late spring frosts or early fall frosts occur. It is generally recognized that the 2.0 planting depth is optimum for corn stand establishment and yield. Too shallow a planting depth (<1.5 inches) may result in drying out of the seed, if extended dry conditions occur before and after planting (especially in tilled seed beds), and increased lodging because of poor brace root development. Too deep a planting depth may delay emergence under cool soil conditions (especially in heavy clay soils), leading to increased pest incidence, soil crusting, and potentially poor stands. We conducted field-scale (10 to 20 acres) studies in 2013 and 2014 with growers in Cayuga, Livingston, Orleans, and Seneca County to evaluate early plant populations and yield of corn planted at 1.0, 1.5, 2.0, and 2.5 inch depths. Planting dates differed across locations and growing seasons (May 14 and June 1 at Cayuga Co.; May 6 and May 29 at Livingston Co.; May 14 in both years at Orleans Co.; and May 7 and June 2 at Seneca Co. in 2013 and 2014, respectively). Because wet conditions delayed corn planting in2014, growers at three locations had to shorten the maturity of their hybrids (P0533X at four sites in 2013; but P0216 at Orleans Co.; DKC50-84 at Seneca Co.; and P9690 at Cayuga Co. and Livingston Co. in 2014). Seeding rates also differed across locations (~38,000 kernels/acre in 2013 and 32,000 kernels/acre in 2014 at Cayuga Co.; ~37,000 kernels/acre at Livingston Co. in both years; ~34,000 kernels/acre at Orleans Co. in both years, and ~33,000 kernels/acre at Seneca Co.in both years). Silt loam soils predominated at the Cayuga Co. site, clay loam soils at the Livingston Co. and Orleans Co. sites, and silty clay loam soils at the Seneca Co. site. The Cayuga Co. site (20-inch rows) was chisel-tilled, the Livingston Co. site (30-inch rows) was moldboard- plowed, the Orleans Co, site (30-inch rows) was disk-tilled, and the Seneca Co. site (15-inch rows) was no-tilled. Soybean was the preceding crop at all locations in 2013 and at Cayuga and Seneca Co. sites in 2014, but corn was the preceding crop at Livingston (same field) and Orleans Co. in 2014. Corn plant populations responded to seeding depths at all locations in both years but the optimum depth varied across locations and years, including across years within locations (Table 1). Likewise, corn yields responded to seeding depths at all locations in both years (except for Cayuga Co. in 2013), but as with populations, the optimum depth varied across locations and years, including across years within locations (Table 2). Table 1. Early plant populations (V3-V4 stage) at four locations in NY during the 2013 and 2014 growing seasons. Table 2. Corn yields at four seeding depths at four locations in NY during the 2013 and 2014 growing seasons. Plant populations did not have a year x seeding depth interaction at Cayuga County and showed quadratic responses to seeding depths in both years with maximum populations at the 1.5 to 2.0 inch seeding depths (Table 1). Yield, however, did show a year x seeding depth interaction. Yield did not show linear nor quadratic responses to seeding depth in 2013 at Cayuga Co. (although the 1.5 inch depth yielded significantly greater than the 2.0 inch depth), but did show a quadratic response in 2014 with maximum yield occurring at the 1.5 inch seeding depth. The 1.5 inch seeding depth resulted in close to maximum plant populations and yielded more than the 2.0 inch seeding depth (but similar to the 1.0 and 2.5 inch seeding depths) when planting in mid-May in 2013 or early June in 2014 on silt loam soils at this site. Corn plant populations and grain yields had year x seeding depth interactions at Livingston Co. (mostly because of damage to corn at the 1.0 inch seeding depth in 2013). Corn plant populations showed a quadratic response to seeding depth in 2013 but a linear response in 2014. (Table 1). Plant populations and resulting yields were exceptionally low at the 1.0 inch seeding depth in 2013, presumably because heavy rains shortly after planting resulted in herbicide and/or fertilizer damage to corn planted at the 1.0 inch depth. Plant populations and grain yield showed linear responses to seeding depths in 2014 as the 2.5 inch depth had the greatest plant populations and grain yield. Extended dry conditions ensued shortly after planting at this site in 2014, which delayed and reduced emergence at the 1.0 inch and 1.5 inch depths. Clearly, the 2.5 inch seeding depth was optimum at this moldboard-plowed clay loam site when planting in early May of 2013 or late May of 2014. Corn plant populations and grain yield had strong year x seeding depth interactions at Orleans Co. (Table 1), presumably because of very different weather conditions after planting. In 2013, an extended dry period occurred for a few days before planting and for 15 days after planting. This probably contributed to the quadratic plant population response to seeding depths (higher populations at the 2.0 and 2.5 inch depths compared to the shallower depths, which apparently dried out). Yield, however, showed a linear response to seeding depth with maximum yield occurring at the 2.5 inch depth in 2013. In 2014, a severe thunderstorm dropped almost 2 inches of rain immediately after the grower finished planting the study. The clay loam soil crusted significantly before and during corn emergence. Consequently, a negative linear response of plant populations to seeding depth was observed with low plant populations at the 2.0 and 2.5 inch seeding depths. Despite, the negative linear response of plant populations to seeding depths in 2014, yields did not differ among seeding depths. It is hard to determine what the optimum seeding depth should be when planting on this disk-tilled clay-loam soil in mid-May because disk-tilling contributed to drying and reduced emergence at the 1.0 and1.5 inch planting depths in 2013, and heavy rains resulted in severe crusting and reduced emergence at the 2.0 and 2.5 inch seeding depths in 2014. Corn plant populations had significant year x seeding depth interactions but grain yield did not have a year x seeding depth interaction at the Seneca Co. site (Table 1). Heavy rains shortly after planting resulted in soil crusting on this silty clay soil in 2013, which resulted in a negative linear response of plant populations to seeding depths in 2013. Grain yields, however, showed a quadratic response to seeding depth with maximum yield observed between the 1.5 and 2.0 inch depth. In 2014, an extended dry period was observed at this location after the late planting, but plant populations showed a quadratic response to seeding depth with maximum populations at the 1.5 inch depth. Regression equations indicated that maximum yield occurred between the 1.5 and 2.0 inch seeding depth in 2014. The 1.0 and 1.5 inch seeding depths on this no-tilled silty clay site resulted in maximum plant populations, but regression equations indicated that the 1.5 inch to 2.0 inch seeding depth resulted in maximum yield when planting in early May of 2013 or early June of 2014. Corn plant populations and grain yields had strong year x location x seeding depth interactions indicating that the “one size fits all” 2.0 inch seeding depth was not optimum across all years and sites. When torrential rains occurred shortly after planting, the 1.0 inch seeding depth had maximum plant populations on a no-till silty clay soil planted in early May of 2013, and on disk-tilled clay loam soil planted in mid-May of 2014. The 1.0 inch seeding depth, however, did not have maximum yield at these sites nor any sites in the study. Consequently, the 1.0 inch seeding depth is probably too shallow a planting depth for corn in almost all situations. The 2.5 inch seeding depth had the lowest plant populations at the two sites mentioned above but had among the highest plant populations and the highest grain yields at the moldboard-plowed clay loam site in both years and at the disk-tilled clay loam site in 2013. Clearly, there is a place for the 2.5 inch seeding depth on some soils in some years. The 1.5 inch and 2.0 inch seeding depths resulted in maximum grain yields on the no-tilled silty clay site planted in early May of 2013 or early June of 2014. At the chisel-tilled silt loam soil, however, the 1.5 inch seeding depth yielded higher than the 2.0 inch seeding depth when planted in mid-May of 2013 and early June of 2014. Consequently, the 2.0 inch seeding depth never solely resulted in the highest yield in any of our 8 site/year comparisons. Although yield differences among seeding depths were usually small, increasing the seeding depth from 2.0 to 2.5 inches at the no-tilled silty clay site decreased yield an average ~6%. In contrast, a decrease in the seeding depth from the 2.5 inch to 2.0 inch seeding depth at the moldboard-plowed clay loam site decreased yield an average ~9%. The significant year x location x seeding depth interaction for grain yield indicates that corn growers in NY should adjust seeding depth to soil conditions (although it is difficult to predict ensuing soil conditions after planting, which can greatly influence the optimum seeding depth for plant populations and yields).